EQUIPMENT INSTALLED: A Vectorflex door with magnetic loop measures approximately 5500 mm wide x 4000 high. 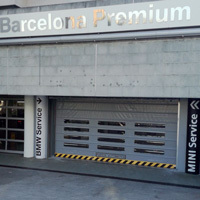 A VECTORFLEX retractable automatic door has been installed in front of a rolling shutter with a control opening and magnetic loop for the use of vehicles in and out with fluidity and dynamism, since the flow of traffic and vehicles is constant all day. With the Vectorflex industrial door you save on energy, without large losses of air and heating.